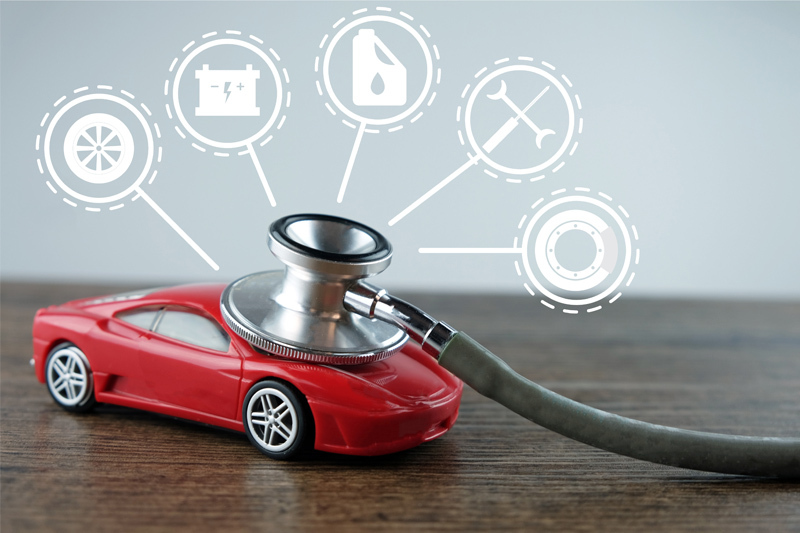 Josh Jones describes the satisfaction that can be derived from a well-executed diagnostic process, especially when you have a holiday to enjoy straight afterwards. I was very happy with the way the solution to the job I am about to describe came about. I needed the answer to show itself to me as beautifully as it did, mainly because I was due to have a week away and I didn’t fancy spending the whole week thinking about where to go next with the diagnosis when I got back, as I have done so many times in the past! 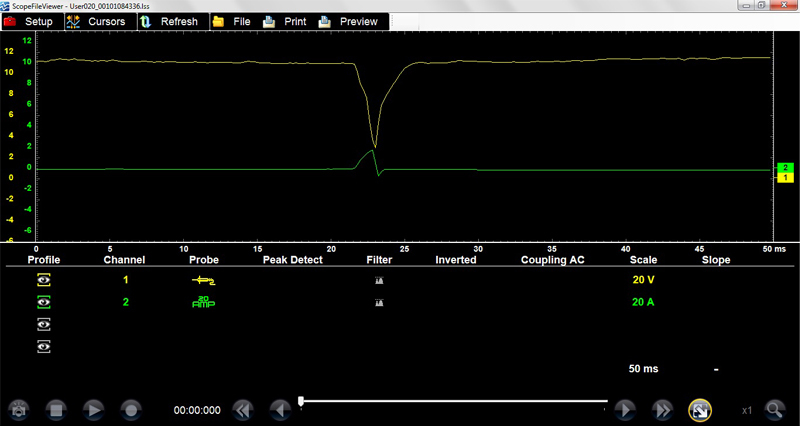 This Nissan Note was presented with intermittent non-start symptoms. It would sometimes start and run for a short period, but it would mainly just make one attempt to start on cranking and then crank only, with what seemed like no further ignition attempts. The 1.6L petrol engine fitted had a bit of a quirk, in that the ignition coils and wiring were difficult to access as the inlet manifold covers them, so I decided the easiest way to get an initial idea as to what was missing was by using a good old noid light on one of the injector multiplugs. When cranked, the light would illuminate once, indicating one injection event and then nothing. This was backed up by what seemed like a mistimed ignition event, as the engine would almost stop dead under crank before speeding up again under the steam of the starter with no further attempts at injection being made by the ECM until the ignition was cycled. To confirm, a quick scan showed no DTCs stored and live data showed good rpm signal, which I confirmed at the ECM harness plug with my scope (cam and crank). A fuel pump prime was also heard in time with the start of cranking every time. I was interested in the weird ignition event that took place once every time I tried to start the car. To confirm what it was doing to the system/battery voltage, I took a simple voltage trace from the battery terminals and cranked the car over. Fig 1 shows just how much current the starter was probably eating when the suspected single ignition event occurred, as then it was dropping the system voltage to way under 5V at the point where the engine was basically being fired backwards. Having seen the system voltage trace, I now wanted to confirm that it was indeed an ignition event causing the engine to behave in this odd way, and obviously I hoped that this trail would ultimately lead me to the root cause. Before I could directly evaluate the ignition side of things, I had to remove the plenum chamber as previously described and it was at this point that things became a little more interesting. Here, I took the opportunity to quickly check the power line and ground to the coils first. I took traces from both, under cranking conditions. The ground seemed to have no issue but the money shot was the ignition coil’s power line. I was looking for a steady 12V supply as you might expect, but what I saw was again a massive drop out in the supply voltage with a quick recovery to normal supply voltage (Fig 2). At first, I thought this must have coincided with the battery voltage dropout in Fig 1, but this event was occurring every time I cranked the engine, even when there was no evidence of the engine firing backwards or forwards! 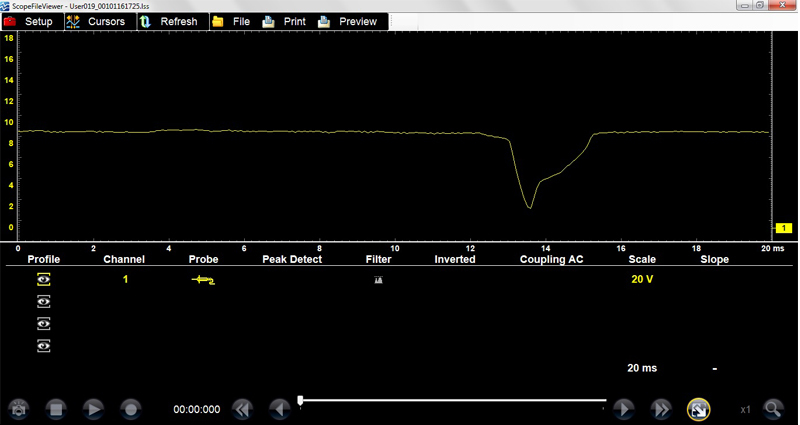 To see if this supply voltage drop-out coincided with anything to do with coil control from the ECU, I added a trace of the trigger circuit for the same coil and again cranked the engine. I saw exactly what I hoped for. In Fig 3, Channel 1 shows the coil supply voltage. Channel 2 is a current capture and shows an attempt by the ECU to fire the coil. You can clearly see that the events fit together perfectly time wise. As soon as I saw this, I knew the hard part was over. To quickly confirm that I had found the issue, I temporarily provided the coil supply circuit with an additional 12V supply, which I knew to be stable (my power probe), and cranked again. The engine burst into life and attempted to start, and I’m sure would have run perfectly had it had an inlet manifold attached! Relieved that the main challenge had been completed, I just needed to find the cause of this obvious poor connection in the supply circuitry. The applicable wiring diagram showed that the coil supply came from the front end junction box via a relay, so I thought this would be the best place to start. With a quick swap for the identical adjacent headlamp relay, the car started perfectly every time, confirming a faulty relay. I thought this case provided a few really interesting learning points that I only thought about once the job was complete. Firstly, the engine stopping abruptly under cranking was indeed indicative of a mistimed ignition occurrence as the induction event inside the coil (albeit a weak one) was taking place early as the trigger signal was being interrupted by the breakdown of the supply voltage. Secondly, I noted during testing that if I cranked the engine with only one coil connected (any one), the engine repeatedly fired, as opposed to just making one attempt and giving up. This was because, with three coils disconnected, the load on the ignition relay was reduced, making the poor connection less significant. Lastly, and perhaps most interestingly, why only one flash of the noid light when the fuel injector power line was from a different source? Clearly the ECM had logged a failed start attempt as it was deciding to switch off injection after one pulse, but no fault codes were logged. That’s why I try to avoid over reliance on DTCs, as they are always only as good as the programing of the controller itself. Anyway, the car was fixed, the owner happy and my brain was free to enjoy my holiday. For more troubleshooting articles online, click here. Previous : Do You Check the Spec?